Keywords are tags or labels you add to your photos to help you easily find the photos. Photos offers a selection of keywords, and you can add your own keywords. You can assign keywords to photos in the Info window or the Keywords Manager, and you can assign keyboard shortcuts to your keywords so you can apply them more quickly. You can use the Keywords Manager to assign keywords to selected photos, manage your list of available keywords, and create a “quick-pick” list of your most common keywords so you can assign them more quickly. Select one or more photos. 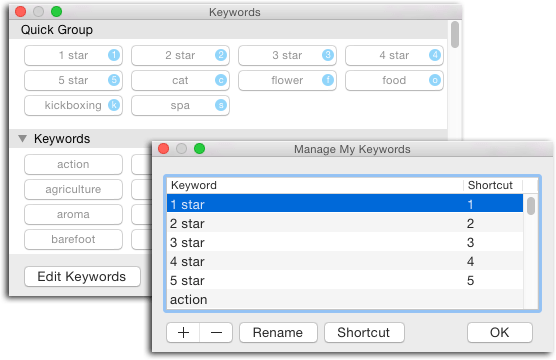 Choose Window > Keyword Manager. To assign keywords to the selected photos, click the keywords. To remove a keyword from the photos, click it again. Add a keyword to the keywords list: Click Edit Keywords, click the Add button (+), then type the new keyword. 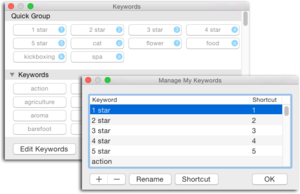 Edit a keyword: Click Edit Keywords, click the keyword you want to change, click Rename, then type your changes. Delete a keyword from all your photos: Click Edit Keywords, select the keyword you want to delete, then click the Delete button (–). Add or change a keyboard shortcut for a keyword: Click Edit Keywords, select a keyword, click Shortcut, then type a keyboard shortcut. 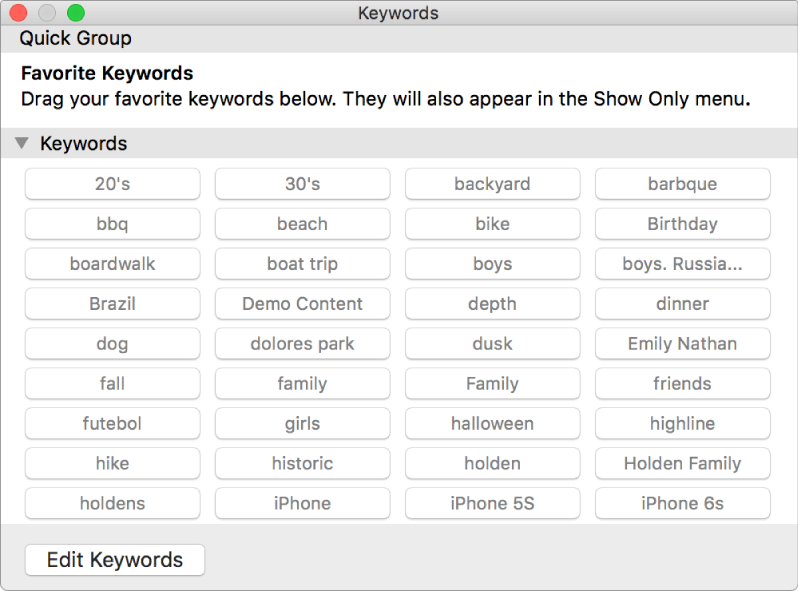 Create a quick-pick list of keywords: Drag keywords into the Quick Group area of the Keywords Manager.Photos gives each keyword in your quick-pick list a keyboard shortcut, so you can quickly assign the keyword to a photo. Smart albums are insanely handy. For example, you can create one that collects all the pictures you take that include a certain keyword, say, comicon, that fall within a certain date range and that are tagged as favorites. Or how about an album that gathers all the pictures of your kids that also includes the keyword vacation? In this column, you’ll learn how to make smart albums and discover a few ideas on how to use them. To create a smart album, choose File> New Smart Album or press Command-Option-N once you’ve launched Photos on your Mac (you can’t create smart albums in Photos for iOS). In the sheet that appears, use the menus to pick criteria. Click “+” to add another row of criteria (to remove a row, click “-”). After adding a second row, use the Match menu to tell Photos to include pictures that match any of the criteria or all of it. Think of any as or; for example, “If a face tag in the photo is Kirk or Spock or Bones, then include it in this smart album.” The other Match choice is all, which gathers only the items that match all the criteria. This smart album limits the content to a certain filename, date range, and face tag. Tagging pictures and videos as a favorite causes Photos to tuck them into the Favorites album (which is also a smart album). Unfortunately, after a few months of happy-go-lucky favoriting, the album gets bloated, so it’s no longer useful for finding stuff quickly. One solution is to track down favorites in specific albums. To do it, create a smart album that includes the criteria “Photo,” “is,” “favorite,” and then add another row that includes “Album,” “is.” Then, pick the album name from the third menu, and then set the Match menu to all. This smart album locates favorited images in a specific album. Another way to tame a gigantic Favorites album is to locate favorites based on a certain time period (alas, you can’t sort the Favorites album chronologically). Create a smart album that includes the criteria “Photo,” “is,” “favorite,” add another row with “Date,” use the second and third menus to drill down to the date range you want, and then set the Match menu to all. This smart album locates images taken in 2015 that you favorited; a great head start on your yearly photo book or calendar project! If you shoot with multiple cameras, you can create separate smart albums for each model. Create a smart album with the criteria “Camera Model,” “is,” “Canon 5D Mark III” (or whatever). Add another row to limit the album to a specific lens, date range, album (or several), favorites, and so on, and then set the Match menu to all. Smart albums can search for aperture, camera model, flash, focal length, ISO, lens, and shutter speed. If you spend a little time training Photos’ facial recognition feature, you can round up pictures of certain people (handy for slideshows and other projects). Create a smart album that includes the criteria “Face” and “is,” and then pick a face tag from the third menu. Add another row that includes “Face” and “is,” and pick another face tag from the third menu. Rinse and repeat until you include all the people you want in the album and then set the Match menu to any or all. This album gathers pictures of Vu Tran or Rebecca Logevall. Set the Match menu to all and both people have to be in the same image to be included in the album. A smart album with the criteria “Photo,” “is,” and “tagged with GPS” gathers all your GPS-tagged images. Add another row of criteria, say, with “Text,” “includes,” “Manhattan,” with the Match menu set to all creates an album with all the pictures you’ve taken (and will take) in Manhattan, New York, excluding any that contain Manhattan elsewhere in their metadata—say, in a description describing the famous cocktail you enjoyed at dinner. If you shoot with a GPS-enabled camera, or you add location data using an app such as the $5 Geotag Photos Pro, smart albums can gather images shot in certain spots. If you (wisely) use keywords and you frequently use the search field to find certain ones, create a smart album that gathers them instead. That way you get all the images that currently have the keyword(s), as well as any future images you apply those keywords to. So if you keyword your flower shots with flower, create a smart album with the criteria “Keyword,” “includes,” and “flower.” To find your macro flower shots, add another row with the criteria “Lens,” “includes,” and “Lensbaby Muse” (or whatever macro lens you use), and then set the Match menu to all. Another scenario is to use keywords to rate images and then have smart albums collect your highest rated shots. For example, if you upgraded to Photos from iPhoto where you used star ratings, Photos converts those ratings into keywords: 1 star, 2 star, 3 star, 4 star, and 5 star. If you use the Keyword Manager (Command-K) to give those keywords a keyboard shortcut (say, 1, 2, 3, 4 and 5), you can keep using the same rating system in Photos that you did iPhoto. To find all your starred items, create a smart album for each rating. For example, the criteria “Keyword,” “is,” and “5 Star” collects all the images in your library with the 5 Star keyword. Once you start using keywords to rate images, you can find your highest rated images in certain albums—say, the graduation album you just made. Create a smart album that includes the criteria “Keyword,” “is,” and “5 star.” Add another row with the criteria “Album” and “is,” and pick the graduationalbum from third menu, then set the Match menu to all. You may even add another row that uses face tags to limit the album to pictures that include the graduate (say, instead of their buddies). Photos has become a bit of a mess with this latest update. It is now very unintuitive and difficult to fathom. I ended up on this page after having to do a web search to figure out where I am supposed to drag the keywords to. We shouldn’t have to do that. The keywords are all greyed out meaning I am unable to drag them anywhere even if I did know where I was supposed to drag them to. Apple is unnecessarily adding confusion to what could be an easy to use app. Keywords are integral to finding your photos, especially as your collection grows. Let’s assume you’ve easily added keywords in the keyword manager. • Now click on a keyword, which simply assigns it to the selected photos. • You can add several keywords to a photo.